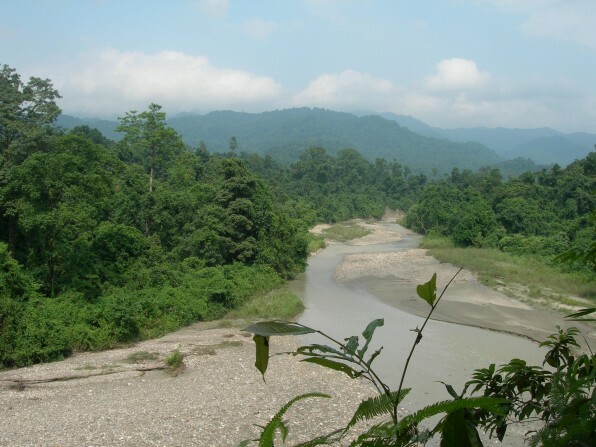 Kumar, Khem (my field assistants) and I were in Khari, which is an anti-poaching camp along the southern boundary of Pakke Wildlife Sanctuary & Tiger reserve in Arunachal Pradesh. 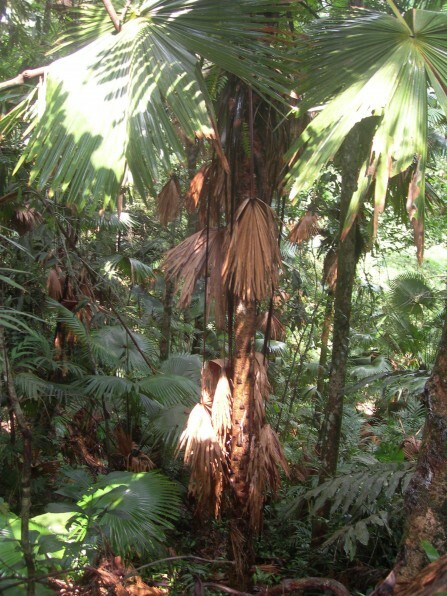 Our work plan was to explore forest patches here and locate as many populations as possible of our study species, Livistona jenkinsiana (commonly known as the Toko tree). 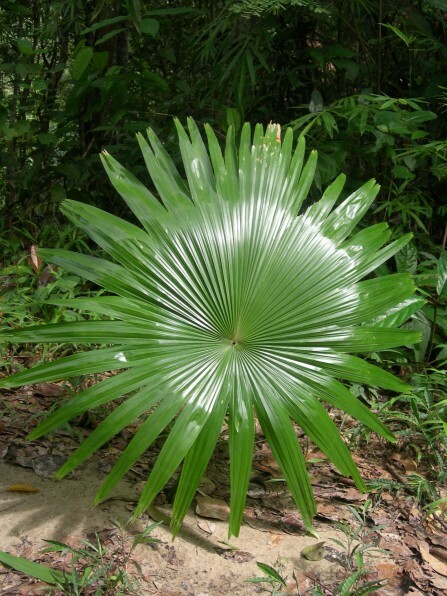 The Toko is an ecologically and economically important Arecaceae member found in the tropical forests of Arunachal Pradesh. Several animals such as hornbills, squirrels, porcupines and wild boars are observed to feed upon its fruits. 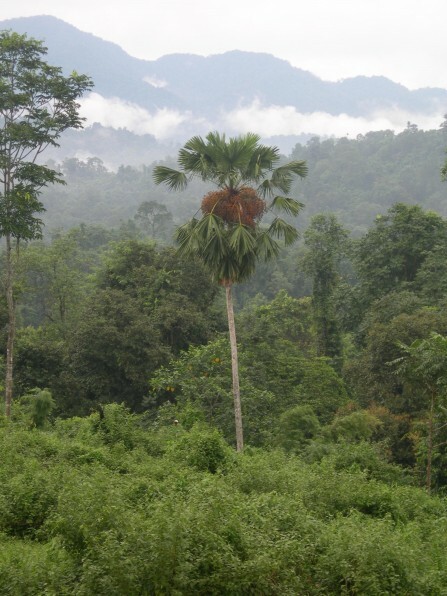 Several tribal communities across North-east India are known to extract their large leaf fronds to use as roof thatching material and the seeds are used for consumption as a substitute for betelnut. The interesting thing is that unlike symbolic tropical plant species, the Toko exhibits clumped and patchy distribution, restricted to specific microhabitat conditions. In Pakke there are quite a few areas with substantial populations of Toko. 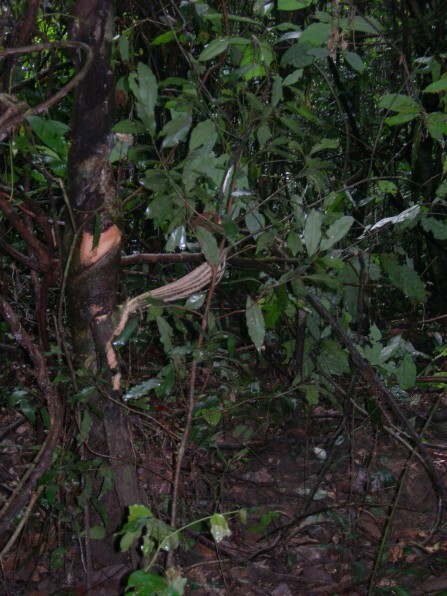 However local communities continuously harvest the species and often the entire tree is cut down. Due to its increasing rarity in many areas in the wild, we thought it would be vital to study its reproductive ecology in this undisturbed but fragile rainforest ecosystem. Thus the first step was to explore the forest and get acquainted with the pattern of its patchy distribution. Toko leaf: Its big size and waterproofing texture makes it a perfect roof-thatching material. It was the month of August and so it wasn’t surprising that our day had begun with heavy showers. We had our usual early meal and then sat around waiting for the rain to stop. In a couple of hours it stopped but the sky was still very dark. However our low ration levels kind of forced us to be optimistic about the weather and go ahead with the planned work for the day. So, Kumar, Khem and I pulled on our leech socks, packed some biscuits and cucumber (our usual lunch) made sure our equipments and observation sheets had enough water-proofing and set out to see what the day had to offer us. The river was wide and high and the current really strong. So instead of walking along the river, which would have been easier, we decided to try and find the way through the forest. After a lot of bush bashing and getting ourselves stuck in knee-deep mud a few times, we reached the area we wanted to explore. Three of us were proving to be a great team. Kumar was doing a grand job of finding the way through the forest and Khem was extremely happy to use the GPS. It was with some difficulty that I managed to fill in the data sheets without getting them too wet. The leeches however were proving to be a real nuisance and we were struggling to work and get rid of them at the same time. They would get lodged in your armpits, on your hair, stomach, back, face and even on your tongue. Kumar couldn’t stop laughing when he saw me trying to take a leech out of my mouth. He was probably wondering how I managed to let it in. We had a few hours of productive work. The most exciting part for me was the sight of the first patch of Toko population that we came across. 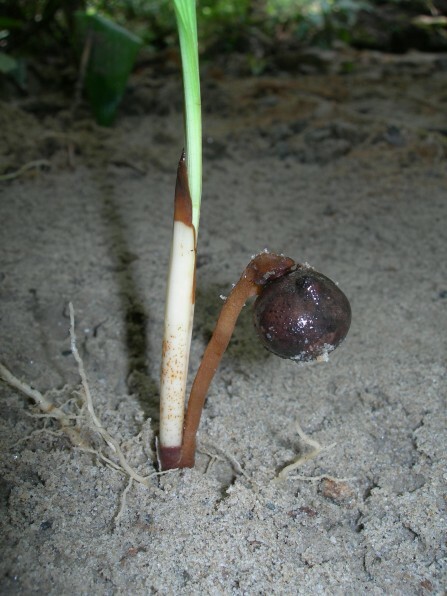 There were one-year seedlings, successive stages of saplings, sub-adults and adults all growing together. What it looked like to me was that in the forest this huge joint family of Toko for some reason had chosen to live on this hill for generations. I thought to myself, this is going to be very interesting, to try and find out what results in this patchy and clumped distribution of Toko. 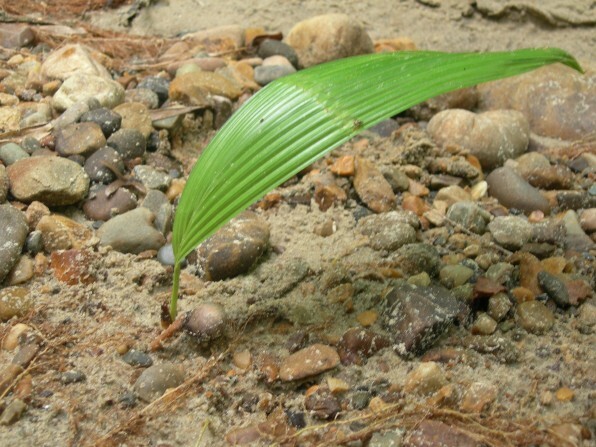 Is it (i) resistance to density dependent mortality below the parent tree in specific micro-climatic conditions, or is it ii) dispersal by specialized animal species that defecate the seeds in clumps in specific micro-climatic conditions required, for germination and recruitment? Or there is something more complex going on? The sky slowly started getting dark again and my GPS started losing signal. The leeches also decided to be more affectionate towards us. It finally started drizzling, and this soon turned to a heavy shower. Leeches and the heavy rain didn’t stop me though and I continued on my Toko search. I think subconsciously I was enjoying the happiness of overcoming the initial nervousness I had, about my decision of working in these interior rainforests of India. This was my very first endeavor of learning about these mysterious forests. 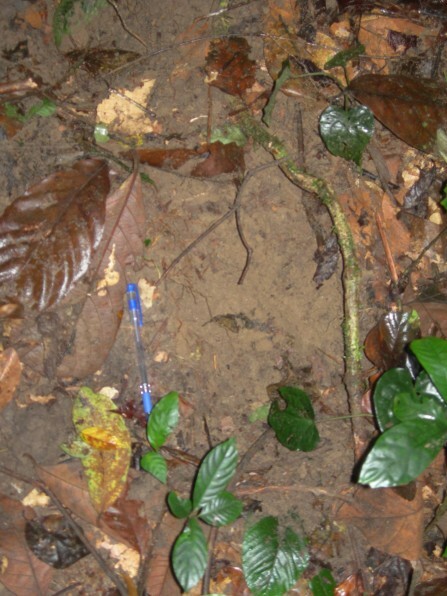 Although extremely excited about starting work in a completely new place with new people, I remember how anxious I was about being able to deal with leeches all over me, walking long distances in these dense unknown forests, the possibility of contracting malaria and independently applying myself to collect meaningful scientific data. The happiness was probably about attaining this feeling of comfort and the increased level of confidence about working and living in this new place. Kumar and Khem however had completely given up on looking out for Toko and were busy removing leeches from different parts of their body with irritated and annoyed faces. I decided it was time we started walking back. Kumar was relieved to hear this and I guess as a return favor said, ‘Abhi hum log naya aur chota rasta se jayega, jungle ke aur ander ander se’ (We will go back through a new and shorter path which goes from further inside the forest). I was happy about this, since it meant being able to explore a new portion of the forest. It was a beautiful patch of forest with small meandering streams with crystal clear water running over pebbles and liana’s hanging over it. The rich soil, the trees, the sound of water and leaves, everything appeared magical and stunning. Kumar and Khem were walking in front and I was drifting behind, thinking how blessed I am, to be able to wander in these remaining patches of pristine rainforests. My thoughts were broken by some sudden noise coming from my right and when I looked up, I saw a ‘Gaur’ running in my direction and it was not more than 10 meters away from me. My first reaction was to run but then I saw its huge horns coming towards me and all I could remember are two thoughts running through my head. First, the Gaur is a little distance ahead of me and is running perpendicular to the path I am on, so if I keep running I am definitely going to get hit’. The second thought was ‘what’s going to happen next?’ I still don’t know if it was a natural instinct, but at that very precise moment I fell down just at the right time. When I sat on the ground I thought, ‘well, Amruta, you have probably escaped the horns but what about the feet? If they touch you even by mistake you are going to be in trouble!’ I closed my eyes and experienced what sounded like the the heaviest leap ever, over me. But that was it. When I got up I saw Kumar and Khem were making loud noises with their ‘daov’ (a local design of a machete) and the gaur was turning back. I ran and stood with Kumar and Khem and added to the noise. The Gaur turned back, but ran in the opposite direction to where we were standing. Once the Gaur had gone out of sight, the three of us looked at each other and spontaneously smiled at each other. Maybe we were happy I was unharmed or maybe we wanted to ask each other if we had imagined whatever just happened. Kumar examined me and couldn’t believe that I had managed to escape without even a scratch on my body. We went to see the place where I had fallen and to find out from where and why the Gaur had come running the way it did. What was surprising was none of us had noticed the animal until it came so close. None of us got a chance to tell each other to get prepared to run or defend ourselves. We think it was unlikely that it was standing there and just charged me. What was more probable was that it was already running away from something like a tiger or wild dogs and that I just happened to come in its way while it was running to save its own life. I guess only the Gaur knows why it was running at that speed. We saw the tree that the animal had banged his huge horns on, and had I not sat down, my condition would probably have been worse than that tree. What made me feel good about myself was that I did not panic at any point during those 10secs. I guess in such situations no one does since there is no time to panic! It is difficult to describe the exact feeling but I believe I felt lucky, happy, special and thrilled about those 10 seconds. On the way back we were discussing about the incident. I had been in the park for nearly three months and not seen a wild Gaur and I kept saying to Kumar and Khem, “etna din jungle mein gur raha hai, phir bhi Gaur nahi dekha ab tak.” (I have been roaming in the forest for so many days but still haven’t seen a wild Guar). Khem now said, “apko Gaur dekhna tha na! dekho! aur nazdik se dekho! (You wanted to see a Gaur right? Do you want to see a Gaur any closer now? )?” We all laughed. What a day it had been. I thanked nature for taking care of me and making one more day of my life so beautiful and special. Very nice… Thanks for sharing the story and the pics.